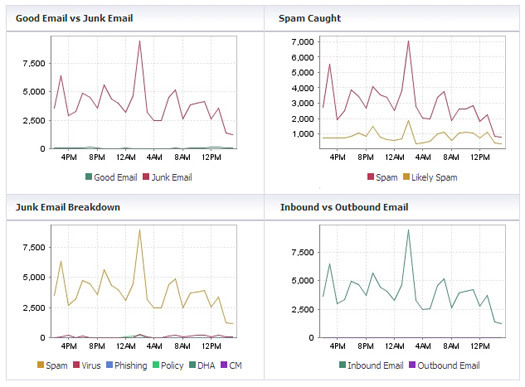 SonicWALL Email Security solutions self-monitor their functionality and performance, and can automatically generate alerts. 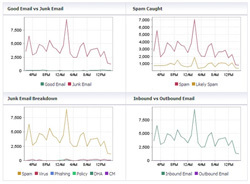 For reporting, administrators can easily customize granular or system-wide reports and charts on threats, compliance, policy, connection management and more, and have these reports automatically generated and emailed as required. 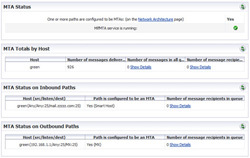 SonicWALL Email Security monitors and logs all activities including for example messages rejected by the IP Reputation service. Once logged in, you can quickly determine the health of the overall system. In addition, there is a simple to use performance monitoring and reporting system, which allows you to quickly determine the current and past performance of the different system components such as the MTA, the Appliance operating system and update services and more.